so after our semi-volunteer FAIL on christmas day, we were inspired to find another way to lend a hand and help out those in need. i'd heard about the give a day, get a disney day program for 2010 from the land of the mouse, which was kicking off on january 1st. and so on new year's day, before we took off for big bear, i logged on and attempted to sign up. hey, i'm all about doing something for the community just because, but i'm not gonna turn down a freebie. that makes me pretty shallow. i know. we'd been talking about helping serve the homeless at the l.a. mission, and i was pleased to note that they were a participating organization. but a free ticket to disneyland/disney world for the mere price of one day of volunteering proved to be quite a draw for a zillion other people, it seemed. the website was so backed up, every time i tried to register, it froze. boo. i kept trying via my iPhone as we drove along, but to no avail. i gave up and decided to try again later. of course, by the time i was able to get in and finally get us registered, every shift at the mission was taken. there had been other interesting tasks too, like helping to pack boxes at food pantries and shifts with habitat for humanity, but those were all booked up as well. i think it's great that volunteerism is getting a big nudge (despite the fact that it took dangling a carrot in front of a lot of folks - including me - first), and i hope that it only serves to open people's eyes and inspire them to continue on throughout the year, with no other motivation than to help those who need it. anyway, as i scrolled through the other organizations who were participating, i came across several others that looked interesting. i filled out the short forms to indicate our interest and waited to hear back from them. it took a couple of days before i finally received the first response - and it was slightly discouraging as the e-mail told me that they had enough volunteers and weren't accepting any more. dang. and then another one popped up from the volunteer recruiter at the orange county rescue mission. 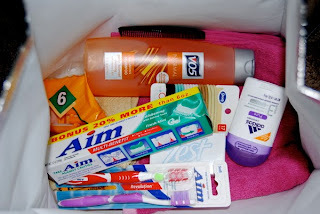 they were asking people to donate hygiene kits for the folks who were staying at their "village of hope." 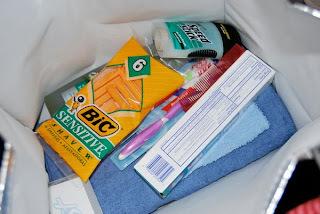 each kit was to contain basics like a towel, washcloth, soap, shampoo, toothbrush and toothpaste, and deodorant. and since we hadn't received responses from any of the other organizations we'd contacted, i signed us up. 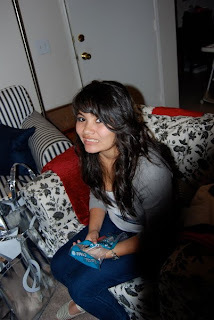 the teen smiled/grimaced as i snapped away. 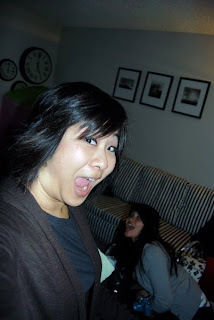 i made my usual stupid face. 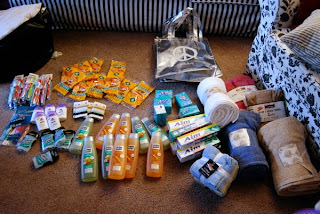 i was happy to have found so much great stuff at the stores we visited. 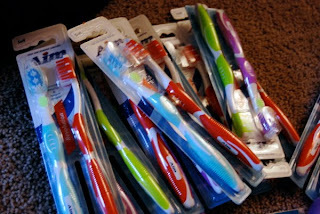 and i liked that the toothbrushes came in a 2-pack - one for now, one for later. the bean tiptoed her way through the piles of stuff on the floor, picking up items now and then to inspect them. and then she lost interest and turned away to chase the dog around. 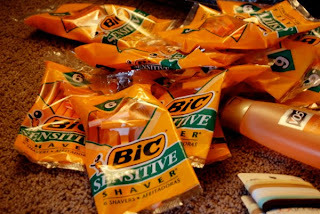 i thought that tying a little pink ribbon around the handles for the womens' kits would help distinguish them from the others, so that a dude didn't end up with girly smelling deodorant and a pack of hair ties. ha! 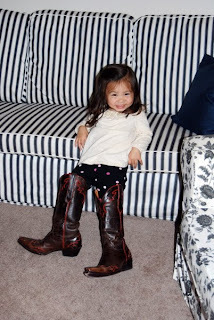 by the time we were done, the bean had tired of torturing mollydog and had found my boots in the closet. she was pretty proud of herself for managing to put them on (and on the right feet, no less) and scurried over to show us proudly what she'd done. we drove down to tustin on saturday afternoon to drop them off, and that was that. it was nice to do a little bit of good - there are more than 150 folks - men, women, children - living in the facility and i hoped that our tiny contribution would be of help to a few of them. 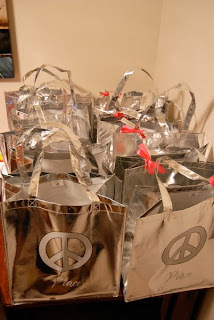 at the very least, maybe the fun silver bags will make someone smile. Like Nanette - I tried to sign up but there was nothing available. Which I think is a really great thing. Disney bribing or not, it's fabulous that people are volunteering. That is an awesome cause. My sister and i were just talking about how when you can't wash your hair or brush your teeth, you just don't feel RIGHT. Whether or not you got enough for everyone is immaterial; you helped 10 people feel good about themselves, and that's a LOT. That's really sweet of you and your family to volunteer your time. I love that the bean put on your boots! Too cute.